This may seem obvious or in some cases silly if you think the person you're working with is someone you'd never find in search results. You will be amazed at how often you are wrong about this. You're not just looking for business search results. Rather, look for results that will help you learn more about your contact as person. Knowing them on a personal level will make working with them more rewarding and easier. Googling your contact may reveal likes/dislikes that they have and save you from killing a sale because you said the wrong thing. On numerous occasions I have come across city board meeting minutes that include some input from a prospect or contact we have gotten. Knowing how your contact feels about certain issues will help you relate and get a better feeling for how they tick. Not everyone's profile is public, but for those that are, you can learn a lot about a person. Pictures are often enough to learn about the personality of a prospect. If they don't yield any hunches, look at their updates, their friends' updates that they comment on, and the interests/likes/profile info in their profile. If you are feeling lucky, add them as a friend and see if they accept. If they do, you can really dig into their profile. Learning about the characteristics of their friends can be a huge help as well. If you know who they like as people, you can work on finding out what they like in a friendship. It's certainly easier and a better feeling when you are selling to someone you feel that you know well, than when you know nothing about them. Like Google and Facebook, Twitter allows you to do some research on what your contacts are all about. Twitter provides all of a user's supplied information and their updates to anyone that wants to read them. You may even run across them in your Googling of the contact. Like Facebook, you may want to check out who the contact converses with most on Twitter and what they talk about. It may help you find things that you both have in common. It may even reveal a common connection that you both have. It would be silly of me to ignore LinkedIn. All of the opportunities that I have already mentioned for the other sites apply here as well. This is one network that probably makes sense to establish a connection with the prospect up front in. It's a business social network, so you reaching out to them there makes sense. Take a look at groups that the prospect may be active in, and see if you have any connections in common. You may want to check to see if your competitors are connected to the prospect and if they have worked together. It will tell you what they are used to in terms of service level, and hopefully better prepare you for any comparison requests you receive. 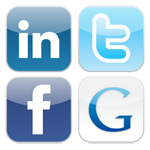 All in all, the various social media sites can shine a bright light on who you're working with and trying to work with. All privacy/security discussions aside, this makes for a tremendous tool for prospect and competitive intelligence gathering. Try to keep these research practices in mind when you maintain your various social profiles. What do you want your prospects, customers, and vendors to find?